Last July when we went to see the fireworks in Lexington, I brought along a few magazines, because I knew it would be a long wait. Pierce snagged an issue of Popular Mechanics and became obsessed with an article on smart watches. We have heard so much about smart watches in the past months. Pierce asked all of our family to give him money for his birthday, so that he would have enough for a smart watch. Pierce has long had a watch obsession. It isn't unusual for him to wear two or even three watches at once. Indiglo watches, calculator watches, athletic watches, Lego watches. They are all fascinating to him. He strikes up conversations in public with strangers about their watches. Recently he met someone in the library who had a solar watch that he found very intriguing. Pierce was thrilled to finally get his smart watch the day after his birthday. I put some game apps on it for him, and he especially likes the rubik cube and the drawing app. A week after The Amazing smart watch was purchased, Paul took Pierce on a bike ride. I decided to take the twins to Toys R Us. They still had their birthday gift cards (from last August!) that my aunt and uncle gave them. Reid picked out a deep sea diver toy set. Cort (who wants to be just like Pierce) picked out a VTech kid smart watch. Who even knew they made them. Cort got home and the drama began. Cort's smart watch could take pictures and video. It had a voice recorder which could distort your voice into robotic voice or chipmunk voice. It had a little owl that would teach Cort the time. In truth, it was a pretty neat watch for kids. Pierce was a little green over Cort's new 'smart watch'. Cort, being the bratty little brother he is, tormented Pierce by recording messages like "I love my new smart watch! It is better than Pierce's smart watch" and then playing them back ad nauseum in the chipmunk voice. Poor Pierce. His watch is still pretty awesome. But man, life as the oldest is sometimes so tough! It sounds like hours of entertainment! I love that your boys have such deep interests in things.....and the tormenting actually brought a giggle to my belly this morning. I hope Pierce can ignore it though. He loves his watch doesn't he? And having one young sibling is hard, but two - must be tough. I am sure it makes him stronger! lol They are all so cute. Ha Ha---I remember those days. My oldest will agree with your statement. Bert was about 6 years older than Mark (and Mark and Jeff are only 16 months apart in age)---Bert was definitely the big brother... He loved his little brothers --but they would drive him crazy at times!!!! SO---I do remember those days. Those watches really are smart, aren't they?? ?Who knew???? In my family the kids were all spread out, but I still admired anything my older brothers did. Oh no on the messages! I have that VTech watch on my radar though. I'm thinking that will be great for my son. I have a solar watch! I'll have to show it to Pierce next time I see him! Oh my goodness. It's funny yet sad in a way. I tell you, Lisa, all of your boys are "smart", really and truly. They are just amazing. My son LOVED watches too! We potty-trained him by rewarding him with a watch. He could tell time and time zones by the time he was 4. I think it was sort of Rainman-esque because he'd freak out if all the clocks in the house weren't synchronized. He turned out pretty normal. Whew! The expression on Pierce's face is priceless! My dad was always fascinated by watches and clocks... any technology really... and he hit the pinnacle when my brother and I got him an 'atomic' watch and clock for his birthday/Christmas. Your boys are so full of fun. Know what-- mommy read about that smart watch and now she thinks she wants one. Where do you get one? Oh my gosh, this was so funny. Not to laugh at Pierce, but I could understand his frustration. The photo you took says so much. Cute! 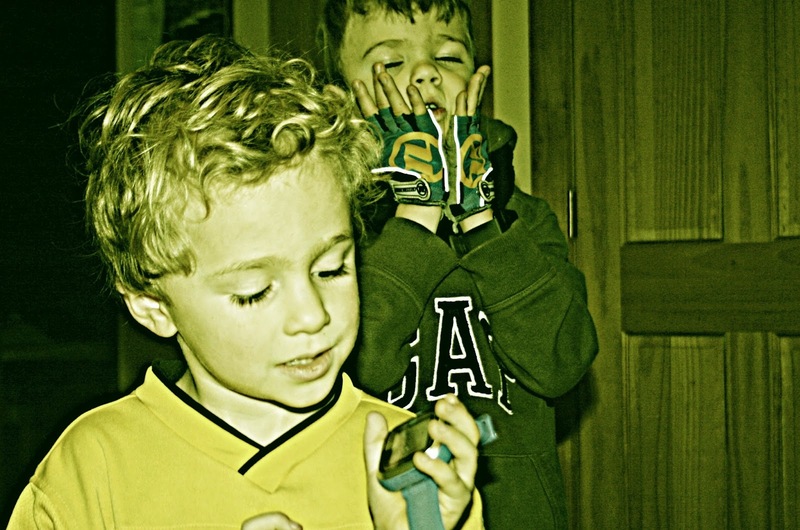 a smart watch I hadn't even heard of them-love the photo, your boys are too cute! that's the problem with technology. No matter what you get, somebody has something better. My son suffers from this issue, and he's 27. The technophiles in the family never outgrow it. Poor Pierce! Out technologised by his little brother! Is there no justice in this world? Blessings and Bear hugs for everyone, even Cort! Well dang it all anyway! That is so how it goes with brothers isn't it? Oh brothers. It's a story they can look back at and laugh. But for now I'm sure they find one another annoying. My son is an only child. That wasn't my original plan, but I'm blessed to have him. :) Kyle loves watches! He has over ten, but don't know how many. He has two watch boxes. I got him a real nice one online with his initials, he loves it! What a nice focus when you think about it. Watches. I interviewed Gordon Bethune, retired CEO of Continental Airlines. He collects them, and has loaned his watch collection to a museum. The "Chipmunk voice" made me laugh!